It’s been one week since I’ve started the 30 Day Kombucha Challenge and so far, I’m feeling great. I’m seeing many of the benefits that kombucha promises. For several years now, I’ve been someone who’s always needed to start out the day with a cup of coffee. Since beginning the challenge, I haven’t had any coffee. I haven’t felt as much of the need for sugary desserts. I’m also am able to eat less and feel satisfied. I’ve tried two different flavors from Kombucha Kamp – love potion 99 and apple pie. 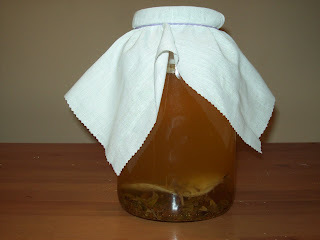 Kombucha tea is a mix of sour and sweet. I find that when first sipping it, the drink tastes very sour. But the more you get into it, some sweetness develops. I preferred the apple pie for the sweeter taste that remained in it. I’m an appropriate omnivore, so I enjoy some good fruit. I love all kinds of desserts made with apples – apple pie, apple gelato to name a few. Being able to mix apple flavor with kombucha is a win win situation for me. Next up, I’ll be drinking a batch of kombucha that I’m making myself (pictured at the top), thanks to a starter kit from Kombucha Kamp. It’s been a lot of fun learning to how to brew kombucha. This is going to be the first of many fermented foods that I’ll be preparing.